Betony is a perennial plant; the hairy, unbranched or slightly branched, quadrangular stem grows to a height of 6-24 inches. The leaves are opposite, more or less fairy on both sides, the lower leaves oblong-cordate, the upper more lanceolate. Spicate whorls of red-purple flowers appear above a rosette of leaves over a long blooming period from June to August. Full sun or partial shade. Found in old European gardens, damp or dry meadows, on sunny slopes, and along forest paths. Anthelmintic, astringent, carminative, diuretic, expectorant, vulnerary. During the Middle Ages betony was grown in monastery gardens and was believed to ward off a host of evils, including mad dogs. 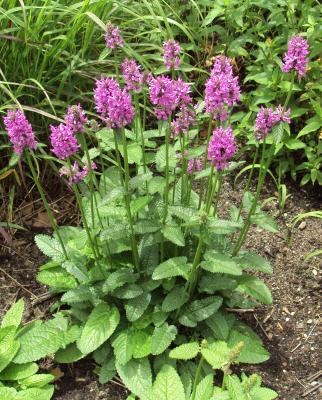 Betony is recommended for asthma and bronchitis, as well as for heartburn. The infusion is also popularly used for neurasthenia, neuritis, neuralgia, bladder and kidney problems, spitting blood, and excessive sweating; regular use is recommended for varicose veins. A strong decoction is said to be effective against worms. The juice of the plant can be used to heal cuts, external ulcers, and cold sores. If you have a sprain, don’t throw away the leaves boiled to make a decoction; make them into a poultice to put on the injured part. Taking 1/2 to 1 cup of the infusion a day is recommended for children who, for no apparent reason, fail to thrive. Fresh betony leaf was believed to prevent drunkenness if chewed before a party, and, as a nightcap, an infusion is supposed to keep away bad dreams. Betony tea is a good substitute for oriental black tea because it is similar in flavor. Can be used daily. Infusion: use 1 to 2 tsp. per cup of water; take 1 to 2 cups during the day, a mouthful at a time. Decoction: use 2 tsp. with 1/2 cup water; sweeten to taste. Take 1/2 cup per day, a mouthful at a time.